Festivals Fairs & Events In.. If exploring the scenic beauty of nature along with some pilgrimage tour is on your mind, then Shimla Tour with Rampur, Sarahan and Sangla is what you need to opt for. Shimla is popularly known as the ‘Queen of Hills’ and boasts of its pristine natural beauty. It is one of most beautiful hill station in India. One can experience the chilly weather, snow clad mountain beauty, emerald lakes, mesmerising waterfalls and lush flora and fauna at Shimla. On the other hand, Rampur Bushahr, Sarahan and Sangla house many religious sites. One can visit the beautiful ancient temples here and seek blessings from the Gods and Goddess. Apart from housing many pilgrimage sites, these places are known for their natural beauty which is still untouched. So book your Shimla Tour with Rampur, Sarahan and Sangla for an experience of a lifetime! Shimla Tour with Rampur Sarahan Sangla is unique from other Himachal packages as in which we also explore lesser known destinations of Himachal Pradesh which are Rampur, Sarahan & Sangla. These places vicinity are famous for its cherry and apple trees and pine nut orchards apart from the amazing natural vegetation, some of the interesting sightseeing places that attract tourists throughout the year. This Package starts from Chandigarh which is well connected destination with all Himachal tourist places. We provide private vehicle throughout the tour and also suggest you good restaurants and hotels in each destination. This is the first day of your incredible Shimla holidays. Arrive at the airport and transfer to the hotel. After reaching, check-in and relax for some time. Later you take a walk down towards the streets of Shimla. Explore the markets of the city and experience the colonial lifestyle in Shimla. Visit Mall Road for some shopping. Here you may find many shops selling artistic items made of wood and woollen clothes. You may also visit the Lakkar Bazaar that has many shops selling handicrafts, carpets and shawls. It is another popular site for tourists in Shimla for shopping. In the evening head back to the hotel and enjoy delicious hot dinner. Prepare for an overnight stay at the hotel. The 2nd day of Shimla holidays begins with lip-smacking hot breakfast. This day is dedicated to sightseeing in Shimla. The first place that you will visit is Kufri. It is 16 km. from Shimla. The drive takes around 60 minutes. Kufri is known for winter sports festivals. Nature lovers can have a great time witnessing the scenic natural beauty at Kufri with the sight of snow-capped mountains in the background. In addition, the slopes and heights of Mahasu Peak in Kufri are tailor-made for adventure activities like skiing and other sports activities. On a clear day, one can see the peaks of Badrinath and Kedarnath from here. After having some entertaining time in Kufri, you will visit Jakhu Hanumana Temple. The temple is devoted to Lord Hanuman. In order to reach the temple, you need to trek 2 km. uphill. The trek offers a magnificent view of Shivalik Mountains. In the evening after coming back from Jakhu Hanumana Temple visit Shimla Church. It is the second oldest church in North India. The beautiful architecture along with the portrayal of Jesus Christ’s life is enough to mesmerize you. Later head back towards the hotel and take the exotic hot dinner. Prepare for an overnight stay at the hotel. Begin the 3rd day of Shimla vacation trip with hot breakfast. Today you shall head for an excursion to Chail. The distance between Shimla and Chail is 55.2 km. and it takes around 2 hours of drive to reach the destination. Chail is one of the most beautiful hill stations of Himachal Pradesh. If you are a nature lover then this place is a paradise for you. The panoramic views of the surroundings is a soul fulfilling sight. The snow-capped mountains, beautiful dense forests make this place nothing less than a heaven. Chail Wildlife Sanctuary is a must visit place in Chail. Here you can see animals like monkeys, sambar, black deer, wild boar, goral, etc. Make sure you carry your camera to capture the beautiful flora and fauna. Another popular spot in Chail is Chail Palace. The palace is located at a good height and gives an incredible view of Shimla. Built in 1891, the fort has tennis and badminton courts, lawns, orchards, children's park and much more. The fort serves as a perfect picnic spot, where you can have a gala time with your family. You may also visit Kali ka Tibba and Gurudwara Sahib. Later head back towards Shimla and take dinner. Prepare for an overnight stay at the hotel. Start your day early today. Post breakfast, check out from the hotel and drive 128 km. to reach Rampur. It takes around 4 hours to reach Rampur. On arrival, check-in at the hotel, have lunch and gear up to explore the popular attractions in Rampur. Rampur is the biggest commercial center in Shimla, located on the banks of the mighty River Sutlej. Begin your trip to Rampur Bushahr with some local shopping which this place is famous for. Pick up some handspun woollen shawls, blankets, rugs or handicraft items like wooden carvings and clay sculptures. Later head to Padam Palace. It is built in an interesting colonial and traditional style with intricate wood and stone carvings. The white colored front door of the palace has a Belgium-glasswork, which is the star attraction of the palace. The Palace boasts of exemplary craftsmanship and architectural design. It is surrounded by a sprawling garden. There are many old Hindu and Buddhist shrines in Rampur. Visit Ragunath Temple, Narsingh Temple, Sri Sat Nahan Temple, Ayodhya Temple and Dumgir Budh Temple for a spiritual experience in Himachal. If you happen to be here in the second week of November, you must be a part of one of the biggest fairs in North India, Lavi Fair. This three-day festival is a major crowd puller from Shimla and other nearby states. A lot of tradesmen and craftsmen come here to buy, sell and exchange articles like dry fruits, fruits, crop produce, handicraft items, shawls, blankets, etc. After the day full of exploration, head back to the hotel in Rampur. The 5th day of the Shimla tour with Rampur, Sarahan and Sangla starts with hot delicious breakfast and later you check out of the hotel and head towards Sarahan. The distance from Rampur to Sarhan is 40 km. and its take around 90 minutes to reach. After reaching Sarahan, check in the hotel and head for sightseeing in Sarahan. Sarahan is a popular pilgrimage place and many temples are located here. In addition, it is the perfect place for nature lovers as it offers spectacular sightseeing views. During sightseeing in Sarahan, the first temple that you will visit is Bhimakali Temple. The main deity of the temple is Goddess Bhima Kali that is said to be an incarnation of Goddess Durga. The architecture of the temple is its major attraction. The temple has a museum inside that displays images of Hindu Gods and Goddesses. The next temple that you will visit is Lankra Veer Temple. The temple’s surroundings look magnificent. The white marble gives it an exquisite look. After sightseeing, head towards the hotel for delicious dinner and prepare for an overnight stay at the hotel. Start the day with lip-smacking breakfast and checkout from the hotel. This day you head towards Sangla. The distance of 100 km. can be travelled in 3 to 4 hours. Stop for lunch at a one of the good restaurants on the way. Continue the journey again after the meal. Upon reaching Sangla, check in to the hotel and prepare for sightseeing in Sangla. The evening time is considered good for watching birds at the Bird Park. The Bird Park is home to different species of birds. If you are a nature enthusiast and love bird watching, the place is perfect for you. The view of colourful birds chirping in the open air is mesmerizing. Several species of birds flock here from foreign countries. Make sure you take pictures of different birds that you spot here. The 7th day of your Shimla holidays belongs to sightseeing in Sangla. Start the day with morning breakfast and prepare for the sightseeing of the valley. The first place to visit during your sightseeing in Sangla is Bering Nag Temple. The temple’s architecture makes it incredibly beautiful. The temple is devoted to Lord Jagas and is considered as an important pilgrimage spot for Hindus. The next spot is, Sangla Meadows. The beautiful backdrop of snow-capped Himalayan Mountains from this place gives a soul fulfilling view. It is one of the best places to rejuvenate and feel the peace that can never be experienced in metro cities. Kamru Fort is the next best place to visit in Sangla. The fort is now converted into a temple. The large image of Lord Buddha on the entrance gate lends it an incredible view. The wooden balconies of the fort make it further attractive. At the end of the day, you come back to the hotel. Take hot delicious dinner and relax with an overnight stay at the hotel. This is the last day of your Shimla vacations. Start the morning with hot breakfast and check out from the hotel. Now you will proceed towards Shimla. The distance from Sangla to Shimla is 223 km. and the drive shall take around 7 hours to reach the destination. Upon reaching Shimla, head towards the airport for onward journey. We hope that the Shimla tour gave you many good memories that you will remember for a lifetime. By Flight: The nearest airport to Shimla is situated at Jubbarhatti, 22 kms from Shimla has regular flights from Delhi but due to bad weather conditions, flights may be irregular. Alternatively better option is to reach Chandigarh Airport at a distance of 120 Kms away, from Chandigarh , you can board Holiday Travel Taxi to reach Shimla in approx 2.5-3 hours. The route offers a panoramic feast of the picturesque Himalayas from the Shivalik foot hills at Kalka to several important points such as Dharampur, Solan, Kandaghat, Taradevi, Barog, Salogra, Summerhill and Shimla. The Railway has 919 curves, the sharpest being 48 degrees. The journey takes about five-and-a-half hours to reach Shimla. By Train: Indian Railways connects up-to Kalka ( about 100kms from shimla) By broad-gauge line. The Kalka station is connected to most major cities in India, including Delhi and Calcutta. Bhimakali Temple: Shri Bhima Kali Temple is a temple at Sarahan in Himachal Pradesh in India, dedicated to the mother goddess Bhimakali. Dedicated to the mother goddess Bhimakali presiding deity of the Rulers of former Bushahr Sate, situated at 2150 meters MSL this magnificent temple is about 180 kms. The Aviary of Himalayan Birds: Himalayan Aviary, also referred to as the Himalayan Bird Park, is located in proximity to the famous Viceregal Lodge in Shimla. Pheasants, peafowl, peacock and Himalayan monal (the national bird of Nepal) can be seen in their entire wilderness in this aviary. The large collection of birds including rare species attracts many nature and bird lovers. The main birds of the park include Himalayan Monals, pheasants, peacocks and peafowl. Srikhand Mahadev Peak: Shrikhand Mahadev is one the toughest pilgrimages in India which is known for Lord Shiva in Hindu Mythology. 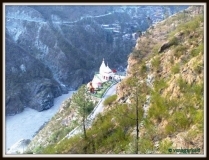 Kullu is also home to several other ancient temples and holy sites making the district a Hindu yatra place visited by thousands of devotees throughout the year. A few glaciers also have to be crossed before reaching the majestic peak of Shrikhand, where pilgrims perform puja. Jeori village is located in Naina Devi Tehsil of Bilaspur district in Himachal Pradesh, India. It is situated 60km away from district headquarter Swarghat. Once you reach this Indian tourist place you can plan for other locations as well. Talking about the attraction of this town, you will not find much spots, but the city itself is beautiful. The hills surrounding are enough to make holidays memorable. Greenery is spread everywhere so you are not going to bore for a single second at Jeori. The religious inclined can pay homage in the ancient and well-known Bhimakali Temple, whereas the adventure enthusiast can opt for treks on various routes. NIRATH (950m): 18 km famous for ancient and unique "Sun Temple" of Nirath. Kaale Channe ka Khatta is a traditional Pahari Dish which is sour in taste and is usually served with rice. This dish is usually served with Madra. Now you know what not to miss when in the region of Himachal Pradesh.